The competition between Britains and Siku from their hugely popular 1:32 scale range has heated up quite hastily over the last decade. Even more so with their 1:32 farm vehicles and implements, well Britains still take the lead with their farm animals and accessories. 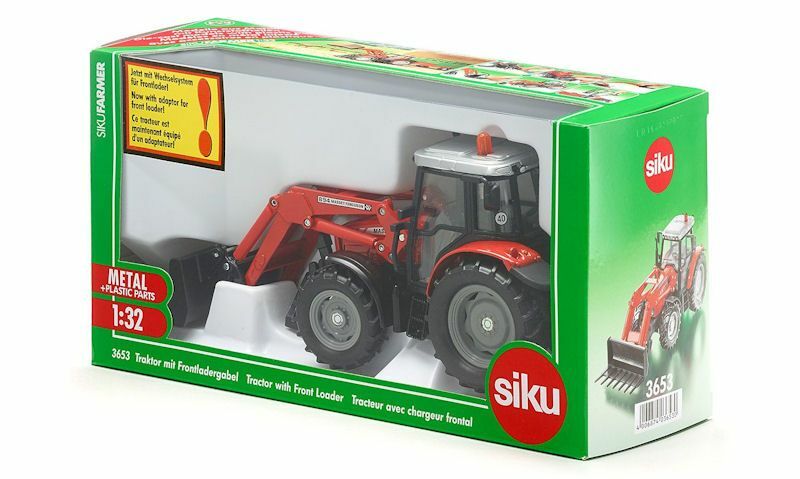 Today, kids and parents alike are spoilt for choice when it comes to the Britains legendary farm toys range or Germany's farm toy pioneers, Siku. Let's compare the two and see which farm toys are better, Britains or Siku. Baring in mind both brands offer close to the same level of choice in regard to toy farm vehicles and implements; tractors, trailers, combines and foragers. But what separates them both in terms of quality and not just quantity. Siku Massey Ferguson tractor with front loader and similar farm toys are presented in packaging just like this window box. The most negative effect on Siku farm toys at this time is simply the lack of 1:32 toy farm animals and farm accessories that will naturally extend the child's play value and where their biggest rival, Britains has dominated for decades. With Siku's target audience of children 3 years and up this will have a huge effect on the collection of Siku farm toy kids can simply build up over time. Siku toy farm vehicles and implements are all made from die-cast metal, a solid construction that will extend the lifetime of the tractor or trailer than any plastic equivalent. However, these well made toy farm vehicles and implements do come at a price and have increased the price in the Siku range by up to 30% compared to Britains farm vehicles and implement range. 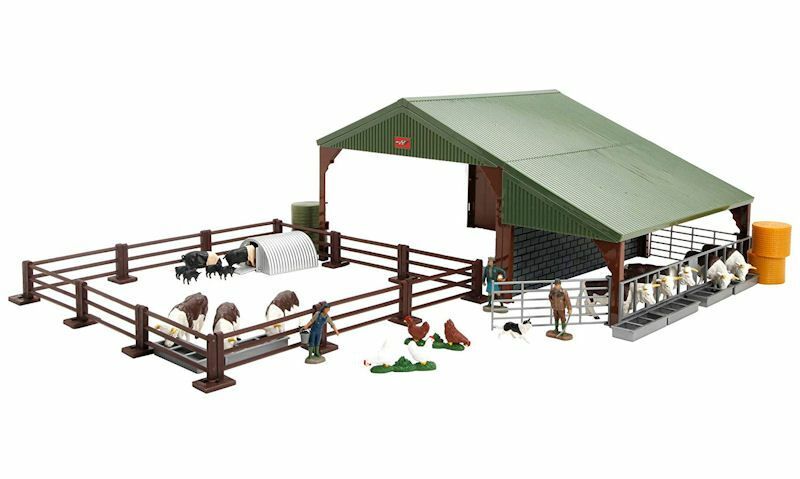 Britains farm building set like this one is presented in a closed box, well their vehicle range are packaged as the same has Siku 1:32 toys. Over the last decade Britains farm toys have extended their toy farm vehicles and implements to replicate a model from every major agriculture manufacturer in the world. In these last few years Britains have reduced their plastic 1:32 toy farm tractors and trailers and replaced this with the slightly more costly die-cast that has sure matched the quality Siku have shown in their replica models. Even today, Britains still loses some credibility with poor quality built farm implements. Such as those implements with plastic bits and pieces that have a tendency of snapping off with very little play. What has always worked best for Britains is their range of toy farm animals and accessories that boost both educational and imaginative play value. With Britains farm toys made from durable plastic, a low end, but still quality product range should be a positive factor for parents. We must simply have to go for Britains as the better option. 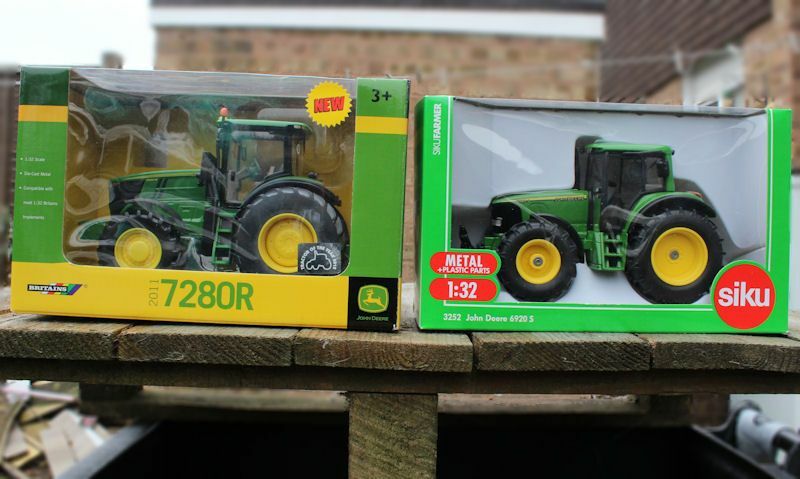 With a larger selection of 1:32 scale farm toys together with improved quality and more reasonably priced items.